You are currently browsing articles tagged Mary Butcher. Fitching, pairing, randing, slewing, waling…. MERL 70/149. A ‘malt skep’, used at Warwick & Richardsons Brewery in Newark-upon-Trent for moving barley from the cistern to the working floor and green malt from the floor to the kiln. The ropes are for dragging the skep across the malthouse floor. This week I’ve started thinking about how best to record the information that we gather during the project. I’ve been exploring the functionality of Adlib, our collections database, to see what sort of things we can record and where. Adlib has specific fields for ‘materials’ and ‘techniques’ which we don’t currently use – these are something I want to experiment with during Stakeholders (which might also benefit other work, such as the craft cataloguing for another project I’m working on, Reading Connections). The advantage of these fields is that they are searchable and, because they are terminology-controlled, the terms used can be standardised. I’ve also been thinking about how to record some of the more detailed information that we’ll hopefully gather. My current thoughts are to complete a detailed recording form for each basket which can then be attached to the database record, in a similar manner to Dorothy Wright’s ‘Catalogue of Baskets’ forms, but hopefully with slightly more detail. We could fill in everything we already know, add to it during the workshop visit, and circulate to participants afterwards for them to check and add any additional information. However, this wouldn’t be searchable as an attachment but it would mean that the information was there – I need to discuss this idea with Ollie and see what he thinks. I’ll also need to think about how to record more general and perhaps tangential information that will inevitably emerge – things like memories and reminiscences, makers’ personal experiences, related photos and films etc. 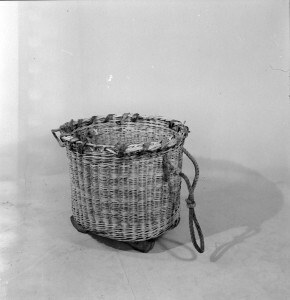 I’ve also been taking advantage of the MERL Library to look for basket-related books and have started to compile a list of key terms – focusing on materials, techniques, and names for parts of a basket. So far, I’ve been through the Basketmakers’ Association’s list of terms, Mary Butcher’s Willow Work, and Sue Gabriel and Sally Goymer’s The Complete Book of Basketry Techniques. If anyone has any other recommendations, or knows of any good existing lists of terms, please let me know! This weekend I went to the Dartington Estate near Totnes, Devon, for the Basketry & Beyond Festival – three days of basket madness on the themes of fishing, farming and fashion. 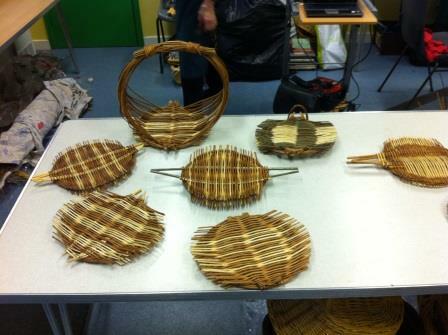 Throughout the weekend there were various demonstrations and have-a-go workshops for both beginners and professional basketmakers, as well as an illustrated talk from Mary Butcher (President of the Basketmakers’ Association, and recent winner of a national Craft Skills Champion award). The Festival ended with a wearable basketry fashion parade, with people wearing things they’d made throughout the weekend. I was in the ‘Heritage Hall’ representing the Heritage Crafts Association, but also telling everyone about the wonderful basketry collections we have at MERL. Our stand was next to that of Dave French, fifth-generation lobster pot maker. Dave has commented on this blog in the past and shared details of his craft, so it was great to meet him and watch him at work. There’ll definitely be a post in the next couple of weeks on lobster pots, as I learned loads, and need to make some amendments to my cataloguing. On Sunday Dave was joined by two other pot-makers, each making pots in a different way. 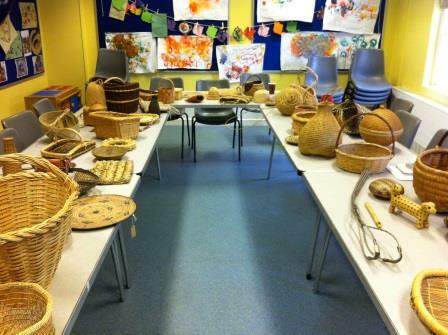 The Heritage Hall was also home to an exhibition about south west fishing baskets, which was based on some of the research that Basketry & Beyond did when they came to MERL a couple of months ago to see our south west baskets. From left to right: Mick Male, bee skeps; Dave French, lobster pots; Alan Lander, lobster pots; salmon putchers. 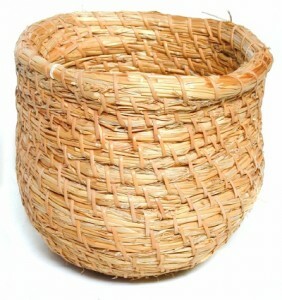 There was an ‘International Hall’ with French, German, Spanish, American, Japanese and Danish basketmakers – it’s surprising how different basketry from around the world can be when it’s all based on the same fundamental techniques. The International Hall was definitely a place that made you say ‘wow’! 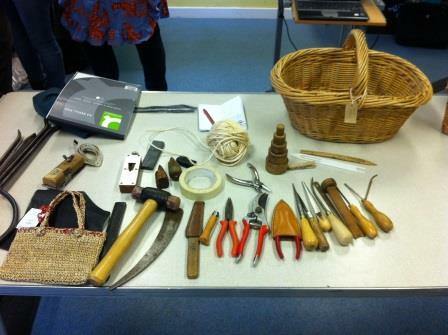 As well as the lobster pot making, I really enjoyed seeing how other things we have in the MERL collections are made – such as salmon putchers, oak swills, bee skeps and wattle hurdles. One of my favourite parts of the weekend was getting to meet the craft legend that is Owen Jones, the last professional swill basketmaker in the UK. Owen was featured in MERL’s Rural Crafts Take Ten project, and you can watch a video of him making his basket online and in the Museum, where you can also see one of his swills. There’s also a good blog describing how he does it. I could watch him working for hours and it took me a while to pluck up the courage to speak to him, and in the end I bought my very own swill – I can’t wait to use it! Owen Jones making swills, and testing the strength of my new acquisition!